See this classic Bill Murray movie Groundhog Day about Phil Connors, a weatherman caught in a personal time warp on the worst day of his life. Teamed with a relentlessly cheerful producer, Andie MacDowell, and a smart-aleck cameraman, Chris Elliott, they are sent to Punxsutawney, Pennsylvania, to cover the annual Groundhog Day festivities. After a surprise blizzard traps him in this small town, things get even worse; Phil wakes the next morning to find it’s GROUNDHOG DAY all over again… and again… and again. 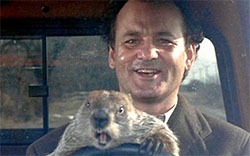 Join us on February 1 and see Groundhog Day. Its First Friday so admission is free but as always, donations are appreciated.